The Studio Museum in Harlem is also in the news this month with the exhibiting news that J. Paul Getty Trust announced the name of the recipients of J. Paul Getty medals, with three awardees ~ and one of them is……Thelma Golden, Director and chief curator of The Studio Museum in Harlem. Other awardees are sculptor Richard Serra and Agnes Gund, President Emerita of The Museum of Modern Art (MoMA). Next up ~ Firelei Báez: Joy Out of Fire will open on May 1st, located at the Latimer/Edison Gallery at the New York Public Library’s Schomburg Center for Research in Black Culture. As described by inHarlem, “For Firelei Báez: Joy Out of Fire, the artist is creating imaginative portraits—“visual road maps,” in her words—celebrating the complex histories of notable black women of the United States and the Caribbean who made their mark on the twentieth century as artists, authors, activists, entertainers, educators, and public officials. Working closely with NYPL Schomburg Center staff, Báez has researched the lives of women whose archives are housed at the Schomburg Center, such as Maya Angelou, Jean Blackwell Hutson, and Ada “Bricktop” Smith, and has explored additional archival holdings to find insights into other figures, such as Oprah, Maritcha Remond Lyons, and Shirley Graham Du Bois. The results will be as many as a dozen intricate new works, which will incorporate materials such as reproductions of archival photographs, notes, diaries, letters and manuscripts. Firelei Báez: Joy Out of Fire will be on view from May 1 to September 29, 2018 at Latimer/Edison Gallery at the New York Public Library’s Schomburg Center for Research in Black Culture, Lenox Avenue at 135th Street in Harlem. Also described by inHarlem, “Maren Hassinger: Monuments will take the form of eight site-specific sculptures installed for approximately one year in Marcus Garvey Park, beginning in June 2018. Working in the tradition of her earlier projects such as Wreath (1978), Hassinger will use branches to create forms that respond to aspects of the park’s landscape—an outcropping of rock, a rectangle near flower beds, an oval near the pool. 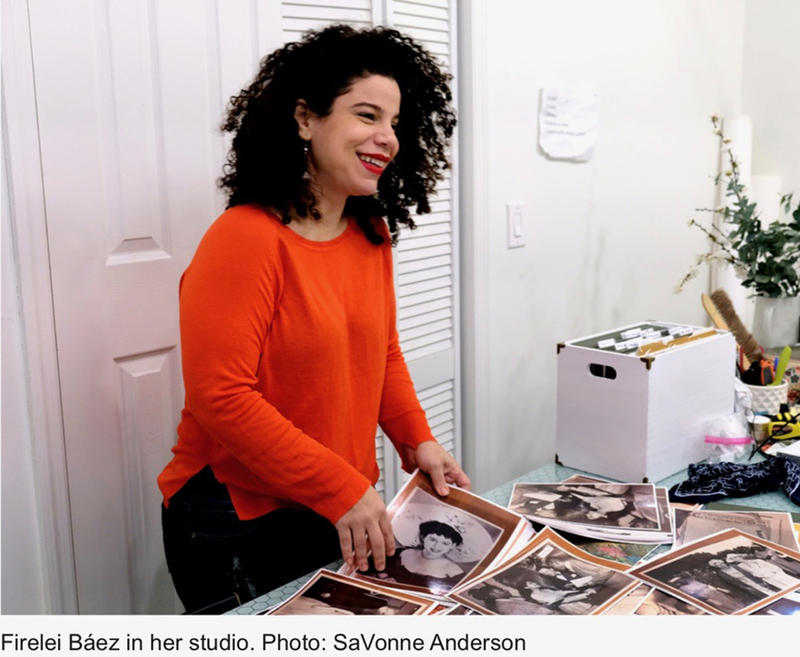 A Harlem resident who regards Marcus Garvey Park as her neighborhood green space, Hassinger will create the works with the assistance of volunteers from the Studio Museum’s Teen Leadership Council and Expanding the Walls program, so that Monuments will be a project made in Harlem and for Harlem. Both exhibitions are organized by Hallie Ringle, Assistant Curator at The Studio Museum in Harlem. Excited to soon experience the works of Firelei Baez and Maren Hassinger. Thank you for the shout out for “Atlas of the Third Millennium” by Jorge Luis Rodriguez, 1980-81 Artist in Residence at The Studio Museum in Harlem. Atlas is on view through October 2018 at Marcus Garvey Park, Oval Lawn off Madison Avenue between 122/123 Sts.